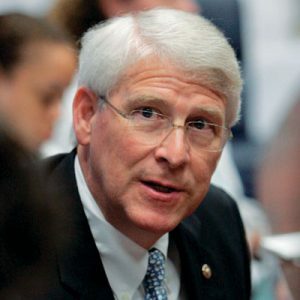 U.S. Sen. Roger F. Wicker has represented the state of Mississippi in the U.S. Senate since 2007. He is a member of the Senate Republican leadership team. As a senior member of the Armed Services Committee, he chairs the Subcommittee on Seapower. He also serves on the Budget Committee; Commerce, Science and Transportation Committee; Environment and Public Works Committee; and the Rules Committee. Wicker is co-chairman of the U.S. Helsinki Commission and has served as the first committee chair in the Organization for Security and Co-operation in Europe’s Parliamentary Assembly since 2014. Wicker also served as a member of the U.S. Merchant Marine Academy Congressional Board of Visitors. From 1995 to 2007, Wicker served in the U.S. House of Representatives. He started his career in public service in the Mississippi Senate representing Lee and Pontotoc counties. He also served on active duty in the U.S. Air Force, retiring from the reserve in 2004 with the rank of lieutenant colonel. He received his bachelor’s and law degrees from the University of Mississippi. Wicker and his wife, Gayle, have three children and four grandchildren.